If you recently received an alert from Montana Wilderness Association and Headwaters Montana, we urge you to NOT endorse the logging increase called for in the Whitefish Range Partnership Agreement. As the alert indicates, the substantial increase in the Flathead National Forestâ€™s â€œsuitable timber baseâ€ would require the removal of Endangered Species Act protection of the threatened grizzly bear. 1. 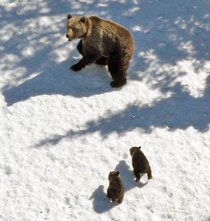 Existing protection of grizzly bear habitat would then be relaxed to allow more logging! 2. The Agreement would â€œchallenge existing lynx management strategiesâ€ to increase the suitable timber base in this threatened speciesâ€™ critical habitats also! The Flathead National Forest seized on this idea the moment it was announced and has proposed to increase the suitable timber base forest-wide, not just in the Whitefish Range! Donâ€™t let the government use your endorsement of the Whitefish Range Partnership as a vote to â€œde-listâ€ the grizzly bear and weaken protections for griz and lynx forest-wide. Click here and a bit more on why this is such a bad idea will appear below. 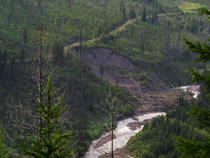 When the Flathead National Forest first drafted a revision of its 1986 Forest Plan in 2006, it reduced the area where logging would be scheduled (the suitable timber base) to 328,000 acres in order to better protect water quality, fish, wildlife, and other forest resources. Following the November 2013 announcement of the Whitefish Range Partnership Agreement, however, the Flathead proposed a new Management Area 4.1a by which to help increase the suitable timber base forest-wide to 509,000 acres as its next step in the plan revision process. Pinning “commercial certainty for the timber industry” to the removal of ESA protection from grizzly bear and subsequent relaxation of its habitat protection is a recipe for disaster for both the bear and industry. It raises false expectations by abandoning the very protections that are helping recover grizzly bear populations, a move that is likely to reverse recovery. Ditto for challenging lynx habitat protections put in place for good reason! (Click here to read our criticisms of the Draft NCDE Grizzly Bear Conservation Strategy, especially pages 5-6).